Clearblue Pregnancy Test with Weeks Indicator is the first and only pregnancy test that also tells you how many weeks since conception occurred. It not only gives you a clear 'Pregnant' or 'Not Pregnant' result in words on a digital display screen, but also if the result is 'Pregnant', it measures the level of hCG to indicate the number of weeks since you conceived: '1-2', '2-3' or more than three ('3+'). 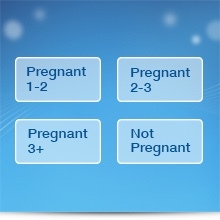 Over 99% accurate at detecting pregnancy from the day of your expected period. Clear digital pregnant or not pregnant results and weeks since conception shown as '1-2', '2-3', '3+' on screen. Weeks Indicator: 93% accurate. Either place the absorbent tip directly in your urine stream for five seconds, or in a collected urine sample for 20 seconds. If you are pregnant, the screen will also show the number of weeks since you conceived as '1-2', '2-3' or '3+'. 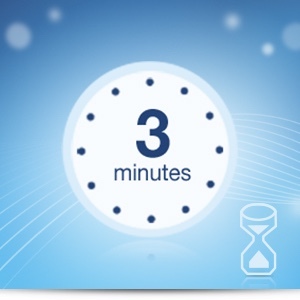 A flashing hour glass 'wait' symbol on the screen shows that the test is working and within three minutes, your 'Pregnant' or 'Not Pregnant' result will be displayed. **Testing early: In lab testing, 98% of pregnant results were detected the day before the expected period, 97% were detected two days before, 90% were detected three days before, and 65% were detected four days before the expected period. If testing before your expected period, and for an accurate Weeks Indicator result, you must use your first urine of the day. ***Weeks' result 97% in agreement with later ultrasound dating scan. Based on studies of 187 women comparing results to ultrasound dating +/- five days. ^'Missed period' refers to the day after you expect your period. 79% of pregnant samples can be detected six days before. 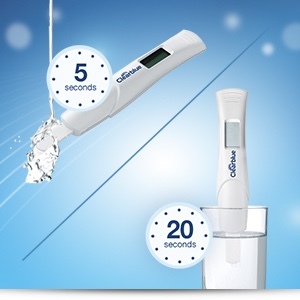 Clearblue Pregnancy Test with Weeks Indicator. 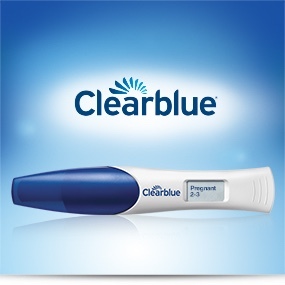 The Clearblue Pregnancy Test with Weeks Indicator. The first and only test that is as accurate as an ultrasound scan at dating pregnancy*. Its smart dual sensor not only tells you in words on the digital display if you're pregnant or not. It also tells you how far along you are – the weeks since conception are shown as 1-2, 2-3 or 3+. 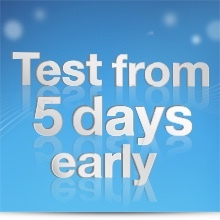 You can test 5 days before your missed period (which is 4 days before your expected period). In lab testing, 98% of pregnant results were detected the day before the expected period. 97% 2 days before the expected period. 90% 3 days before and 65% 4 days before the expected period. (Based on studies of 187 women comparing result to ultrasound dating). The first and only pregnancy test that tells you how many weeks since you conceived. 1-2, 2-3 or more than 3 weeks. For more information on this product or answers to your questions. Our Careline advisors are available for you from 4pm – 12 midnight Winter, 6pm – 2am Summer, AET. (may vary due to daylight saving), Mon - Fri except on bank holidays. 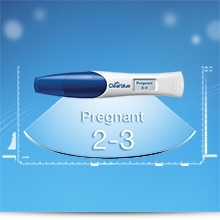 Clearblue Digital Pregnancy Test with Conception Indicator 2 Tests is rated 4.7 out of 5 by 10. Rated 5 out of 5 by Dani19 from Works perfectly! The results from my test were accurate given that the minimal hCG level it picks up to give a positive result is 25 mIU/hCG. I tested positive on this test at 4w + 3d, which unfortunately ended in an early miscarriage a few days later. This product is very easy to use as long as you follow the instructions properly and lay the test flat after holding in urine for 20 seconds. I am confident in using this pregnancy test again in conjuction with a blue or pink dye pregnancy test first, then using this test to confirm. Rated 5 out of 5 by Mappy from Easy to use So easy to use, accurate and good quality. Rated 5 out of 5 by Secret Reviewer from Love these Good for very accurate testing with no squinting at tests needed. The conception indicator gives a rough idea of how far pregnant you are too. Have used successfully.